Through faith, determination, and perseverance, we have been able to do things we never dreamed of back when we were kids. We are a successful businessman and a talented musician. We get paid to do what we love and there is no greater joy than that. How did we do it? We gave, and received far more than we ever could’ve asked for.Hold your hand up. Place in it an imaginary boomerang, one you’ll throw out into the cobalt sky, watching it fly and arc, returning, ideally, to exactly where it came from. The cool thing about boomerangs is that the slightest change in their shape can have a giant impact on whether they return to where they were thrown. A simple shift in the angle of one of its wings can mean the difference between a boomerang that flies in an arc, or one that goes into the distance, off the beaten path. A degree of curve here or there on the blade can bring it right back into your hand…or speed hundreds of feet in the opposite direction. Life is incredibly similar. The smallest actions can lead to the biggest changes and impacts, especially in the lives of others. Think about that for a second. A farmer plants a tiny seed. Months later, after the sun and rain have nurtured it, up from the ground emerges a wondrous vegetable or fruit that will feed someone. A child, carrying her first piggy bank full of saved pennies, is walking to the bank with his mom to open his first savings account. Right before she gets there, she sees a man on the corner, a rusted coffee can in front of him. She can’t read his sign, but she knows he’s suffering. She asks her mom why the man is sitting on the corner, holding a piece of frayed cardboard with big letters written in black ink. “Because he doesn’t have any money,” the mother says. The girl doesn’t know what that means. How could anyone not have money, or a home? Suddenly, inspiration strikes. She asks her mom if she can give the man her money instead of the bank. As she hears the change clink against the aluminum, the girl is filled with an unimaginable happiness. The man will eat. The girl, years from now, having understood early the notion of giving, will pursue a life devoted to helping those in need. She didn’t even know it, but in that instant, the girl had thrown her first boomerang. She felt something inside of her she didn’t even know yet, and put into action a plan that changed her life. Did it change the homeless man’s life? Not entirely, but it did for that day. A simple act of kindness, for him, was a quarter echoing in an otherwise empty Folger’s can. It is the teacher spending an extra minute of her time with a troubled student. It’s the man who shovels his elderly neighbor’s driveway after the snow falls. It is the split second of chance, the tiniest shift of an angle, the precise moment of being in the right place at the right time that allows us to go from being tossed into the weeds, to returning to where we came from. 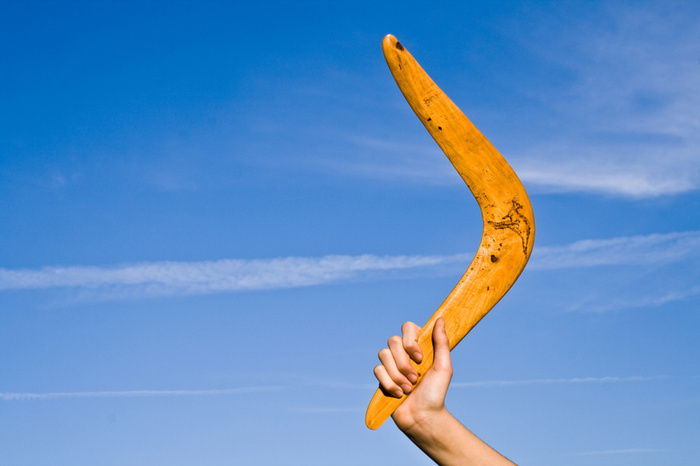 We are the boomerang, and so are you. We never know when a small moment of gratitude will go out into the ether, and either find a landing place, or its way right back to us. When that boomerang returns to you, it’s not the same. It’s gone places, seen things. You should, too. That’s why we wrote Breaking Out of a Broken System. All it takes is knowledge and a passion to help. We’re incredibly excited to give you a glimpse into what’s made us successful in our chosen paths—Chandler the entrepreneur, Seth the world-beating musician. Our paths weren’t easy, and we know yours isn’t either. Our lessons go beyond the boardroom or the amphitheater. That’s the beauty of the human experience: We all go through life facing many of the same struggles, and we hope we can be of some help to you as you face some of yours. We mentioned the beauty of giving, and that’s the truly special thing about Breaking Out of a Broken System. This is a project done entirely out of love, and we feel strongly that anything we get in return for it should be paid forward. That’s why we’re honored to let you know that 100 percent of the proceeds from this insightful book will go toward the Palmetto Medial Initiative (PMI). Literally every single copy of this book sold will directly impact the life of someone affected by malaria. One life-saving pill costs $4, which means that 10,000 lives will have been saved when we sell our 10,000th copy of this book. It’s just that simple. Think of it as saving someone’s life, and getting a pretty awesome roadmap to success as our thank you for investing in the project. Remember that boomerang you were holding? It’s time to throw it. We guarantee it’ll come right back to you. Chandler Bolt is an author and serial entrepreneur. He was bitten by the entrepreneurial bug at an early age and by age 20 he started and ran businesses that generated over $320,000. His most recent project focuses on giving back to others. He has written the book “Breaking Out of A Broken System” with his brother Seth Bolt (from the band NEEDTOBREATHE). Each book sold saves a life (#1book1life). Find out more about the book at boltbros.com or check it out on Amazon.